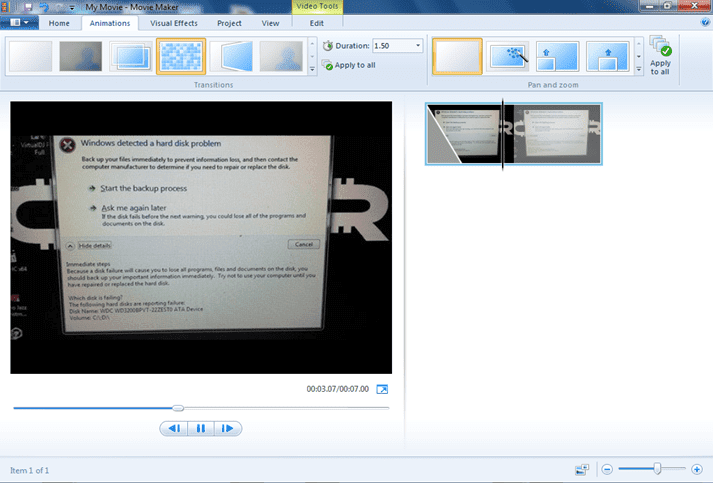 The most common headache in using the Movie Maker is during saving a movie file. Then after a while the progressive indicator will notify eight percent improvement. But a while latter it will suddenly stop the saving and a popup window will notify that saving the file cannot continue because of a certain error. This is I’ll always encountered during I saving the movie maker file in a longer minutes. Because I don’t even reading any instructions provided by the program. It’s because we are timid in reading it. And we are contented that we can convert the movie itself in a desired format. But it’s tragedy, after formatting it you cannot save it. And that’s the time we can receive the troubleshooting instruction. Now, let’s consider what the “Microsoft” told in help section of the Movie Maker. And this is also our best learning material that we should read and learn first the thing that we wanted to use. Just read below the troubleshooting guide before to do anything else of your movie, image or jpeg files. This section covers the following issues when saving a movie to My computer. Explains what you can do if your movie file cannot be created because it exceeds the 4 GB file size limit supported by the FAT32 file system. Explains what you can do if there is not enough disk space available to save your movie. Explains what to do when a movie cannot be saved successfully because the saving destination is no longer available. Explains what to do when a movie cannot be saved because one or more of the original source files cannot be found. The movie file created when you are saving your movie on your computer exceeds the 4-gigabyte (GB) file size limit supported by the FAT32 file system. This message occurs if you are saving a longer movie file at a higher quality setting on a volume or partition that is using the FAT32 file system. The file system is used by MS-DOS and other Windows-based operating system to organize and manage files. Reduce the length of your movie by removing items from the storyboard/timeline in Windows Movie Maker. Choose a lower movie setting when saving your movie. If your computer hard disk has multiple partitions, and one is formatted using the NTFS file system, go back in the Save Movie Wizard, and then save your movie to that partition. The NTFS file system supports files larger than 4 GB. If you are saving your movie to tape and you have multiple partitions on your hard disk, and one partition is formatted using the NTFS file system, specify this drive as the temporary storage location in the Options dialog in Windows Movie Maker (on the Tools menu, click Options). Convert your file system to use the NTFS file system. The NTFS file system supports files larger than 4 GB. For more information about converting a volume to use NTFS, see the topic "To convert a volume to NTFS from the command prompt" in Windows Help and Support. There is not enough free disk space available to save your movie. This occurs when the movie file size exceeds the amount of free disk space that is available. Save the movie to a location that has more available disk space. The specified destination for the saved movie file does not exist. This can occur if you chose to save the movie to a removable storage drive and the drive is disconnected or not available. This issue may also occur if you chose to save your movie to a network drive and that destination is not available. If you specified a removable storage drive as the saving destination, verify that the device is properly connected to your computer and that the drive or removable media is still available. If you specified a network drive as the saving location, make sure that the network cable for your computer is attached properly and that the networked computer to which you are saving your movie to is still available. Specify a saving destination on your computer hard disk. One or more source files cannot be found. Therefore, the movie cannot be saved successfully. This can occur if you try to save a movie after one or more of the source files for the corresponding clips in your project have been moved, renamed, or deleted. Locate the original source file, and move or copy it to the location on your computer when it was first imported into Windows Movie Maker. Verify that any network locations are still available if the source file was originally located on a shared network location when it was first imported into Windows Movie Maker. If you have a movie that exceed to 4 GB in capacity you need a video cutter program. Or else you can use the movie maker and just estimate the files size of it and save it in correct destination where to save the movie files.